The History of the House’s ownership, starting with the prominent Champion-McAlpin Family. The history of the Harper Fowlkes House follows a long and fascinating journey through time and families. • Stephen Gardner, a local shipping magnate, had hired Clunky to design his high style Greek Revival home on Orleans Square, and began construction on the house in 1843. But Mr. Gardner had financial problems, so he sold it to his brother John, who then sold it to Aaron Champion in June of 1843 in order to recoup his losses. Aaron Champion was living on Perry Street across from the House at the time, and he continued with the construction and moved into the House many years later. • When Champion died in 1881, the property was left to his son-in-law, to be held in trust for his daughter and their children: Aaron, James W. Jr., Henry, Mary, and Maria. • Maria Sophia Champion McAlpin died on September 18, 1890, and in 1895 the siblings sold their interest in the House to their brother, Henry. • Henry’s first wife died, and his second marriage in 1895 was to Isabel Wilbur if Philadelphia. father-in-law Elisha P. Wilbur paid off a $15,000 mortgage on the House and then gave it as a wedding present to Henry and Isabel. • Isabel renovated the House in 1895 to accommodate her 5 Irish servants with a top floor addition. The staircase was moved from adjacent to the dining room to the back of the house, thus enlarging the dining room, and the addition of the top floor included a Mansard roof, and increased the value of the property by $6,000. • Isabel died in 1905, and Henry McAlpin died in April 1931; his third wife Mary Auza McAlpin and daughter by his first wife Claudia McAlpin Whitney were left equal shares of the property, but a dispute arose concerning the estate to sell the property, Trust Lot 26 and the house, to settle the estate in 1938. • Alida Harper Fowlkes purchased the property through an auction held by Citizens and Southern National Bank in October of 1939. She bought the house for $9,000. An oral history interview stated that it was noted on Alida’s mortgagee papers they stamped “WOMAN” across the top. • After Alida purchased the House she went into the Antique business and filled it with her favorite purchased antique and family pieces. She was able to buy the two mirrors and consoles in the double parlor from the McAlpin Estate for $200, and also the House came with the six gasoliers made in Philadelphia that Alida electrified herself when she was told it could not be done. Alida also purchased an early American Grandfather Clock from Claudia McAlpin, about a year after the moved into the House, and put it right back in the hall where it had always been before. • Alida died on January 18, 1985. Her will left the property to be held in trust to the Society of the Cincinnati in the state of Georgia. This is an organization of gentlemen who are direct descendants of George Washington’s officers during the Revolution. Alida’s brother William E. Harper Jr., and late father William E. Harper were Society members. In 2014 the great-great-grandson of Aaron Champion donated a portrait of Aaron Champion to the House, and it proudly hangs in the front double parlor. 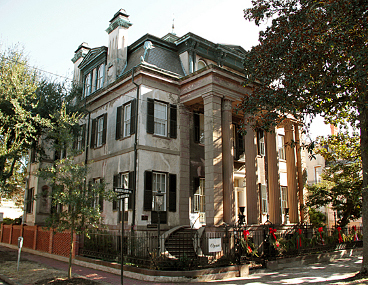 The McAlpins continue to be members of the Society of the Cincinnati, and enjoy the House during Society social functions. Occasionally the House is visited by members of the McAlpin family, and it is enjoyable for the tour guides to hear their stories. We are hoping to renovate the top floor and include some McAlpin family furniture, to honor them and their time in the House.